● Departing the Allen County Fort Wayne History Center parking area to the north, turn west (left) on Berry Street and immediately turn north (right) again at the stoplight at Barr Street. Advance one block to Main Street and turn west (left) and go two blocks to Calhoun Street at the Allen County Court House. Move ahead one block passing Columbia Street on the west (left) which is the “The Canal Landing.” Structures on the north side of The Landing are the reminders of the backs of warehouses and mercantile buildings that served the Canal. Continue south on Calhoun passing under the railroad tracks that replaced the Canal and since elevated marking the Wabash Erie route. ● At the Superior Street stoplight, look to the east (right) across the south east corner parking lot and to the two-story structure at its east end. Known as the Canal House (pictured above), it has survived since 1852 when it was built of sturdy limestone. Another block east on the north side is Headwaters Park where a Canal historical sign is included with several Bicentennial Heritage Trail markers. ● At the Superior Street stoplight, turn west (left); the railroad line on the south side is the route of the Canal, and in one block’s distance cross over the now filled-in turnaround Orbison Basin. Follow Superior Street about one half mile to the 4-way stop at Van Buren Street and turn to the south (south). 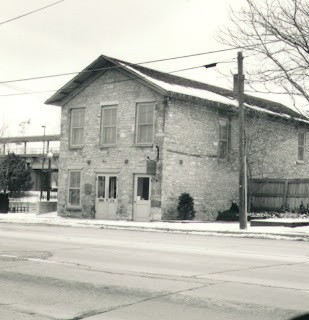 Cross back over the railroad tracks – and site of the Canal line – under the Fort Wayne Newspapers walk bridge to the Main Street stop light. ● Turn west (right) on Main Street passing Orff Park on the south (left) is a monument commemorating the Aqueduct Club, which was formed in the early 20th century by men who as boys swam in the old aqueduct. ● Crossing the Saint Mary’s bridge look downstream to the north (right) and near the site of the modern rail bridge is where the Saint Mary’s Aqueduct once provided boat passage over the river. ● Continuing west on Main Street eight blocks – paralleling the Canal line to the north – at Growth Street an Historical Marker relates the story of the Saint Joseph River Feeder’s junction with the main line of the Canal two blocks to the north and now buried under the railroad elevation. ● About three blocks ahead is a fork in the road (to the north it becomes Leesburg Road) follow the old Canal line which is present-day West Main Street as it leads south past Lindenwood Cemetery (on the right) to U.S. 24. ● Turn west (right) on U.S. 24 and watch for Rockhill Park on the south (left) side. Here in the park is the beginning place of the River Greenway Towpath Trail and features three Bicentennial Heritage Trail Markers. At the U.S. 24 and Freeman Street stoplight turn south (left), Rockhill Park is on the east, and travel to the junction of Portage Avenue. Turn west (right) on Portage and the site of the Canal towpath to the stop sign where it joins with Taylor Street and continues west to the intersection of Ardmore Avenue. ● Turn to the south (left) on Ardmore to Covington Road and turn west (right) on Covington. At about 4/10ths of a mile the flat place in the road is the site of the intersection of the long abandoned Canal line. Another 6/10ths mile at the Smith Road stoplight, turn left heading south. At 6/10ths mile cross the Towpath Trail at Glendale Road and proceed another 4/10ths of a mile to Engle Road. ● Turn west (right) on Engle Road and pass Eagle Marsh on the left side of the road and look beyond to a part of Fox Island County Park that preserves a sand dune that developed during an era of glacial drainage. Between cycles it was filled with water and when it was dry wind activity deposited sands in such a way to create present-day Fox Island. ● Pass under Interstate I-69 and at 1 mile watch for East Woodland Ridge entering U.S. 24 on the left. This is the addition known as the “Hamlets” with its homes set atop the bluff offering a scene to the south. It overlooks the traces of Marias du Perches, the course of the Little Wabash River, the Maumee-Wabash Portage and the Wabash Erie Canal line in the glacier plain. Today, it marks line of the railroad once the domain of the Wabash Cannon Ball. Woodland Ridge west re-enters U.S. 24. Turn west (left) and continue through the stoplight at Homestead Road and approximately in one-half mile turn to the south on Redding Road. ● Redding Road curves sharply to the west (right) and about 8/10ths of a mile joins the Canal bed in evidence on the south (left) berm of the road. The old channel’s prism is visible past a number of houses that have been erected. Unfortunately, there are places where the channel has been filled in and the historic remnant has been lost. Farther west Aboite Road joins Redding Road from the south. Here across from the junction of the two roads standing on the north (right) side is the VERMILYEA HOUSE dating to 1839. This extant structure was a favorite stopping place for Canal boats and the first post office in Aboite Township of Allen County. Rumors persist of its role as an underground Rail Road station during the days that fugitives from slavery followed the towpath from southern Indiana on the Ohio River moving north to Canada and their freedom. ● To the west of Vermilyea House on the towpath was Ruffner’s Basin, a turnaround point and site for loading and unloading barges. Farther along Redding the road makes a sharp turn to the north to avoid Aboite River and the site of Aboite River Aqueduct No. 2 where Canal boats continued westward. Abutments of cut stone on each bank and during low water level in the river, a minimum of 25 foundation timbers are visible. ● Return to U.S. 24 turn west and pass along a large stone quarry at the Allen Whitley County Line Road. Prior to Canal construction this was the site of the Miami’s White Raccoon Village. To return to the History Center, turn around and follow U.S. 24 back to downtown Fort Wayne or turn north (right) on County Line Road and travel north to Indiana 14 intersection, turn east (right) and head for town. When taking your "Historical Tour" take along a camera and photograph any 'historical marker' or 'War Memorial / Honor Roll'. Next Up-load on 'Historical Markers Data Base' (www.hmdb.org - - HMdb.) A fine hobby to do world-wide.